The Lewes 10k is a wonderful occasion with, as Anthony of Sussex Sport Photography remarked, something of the atmosphere of a school sports day. Held on Easter Monday, I ran it last year when it was a sub-aquatic affair, with mud. This year the paths and tracks were hard. Clearly I prefer firm going, as I went round in a creditable 54:43, in spite of still being in recovery after the Brighton Marathon. It was a pleasure to meet another Brighton Marathon veteran, @orbific, aka James Burt. The race begins and ends at the Lewes Leisure Centre, and heads out into the Ouse valley, on a roughly quadrilateral course, along farm tracks, past Iford church, over more fields and back into Lewes near the rugby club. It is therefore mostly flat, odd as that may seem for a race in Lewes. I started towards the rear of the pack, and stayed there for the whole of the race, except, unusually for me, I did pass some of my fellow runners towards the end. Looking at my mile splits, my pacing was on target for most of the race, but I slowed for the third and fourth miles, picking up the pace for the final section. It was a good race and has given me courage for future efforts. The weather continues to be warm. I didn't manage a last minute short run in my marathon kit today but, as they say, I can't get any fitter than I am now. Last night I slept well, apart from an odd dream in which I was at a job interview, but one held in a court room. I was the candidate/accused, and sat behind glass in the dock, while the questions were relayed to me by a dysfunctional microphone. I said time and time again that I couldn't hear the questions, but the jury or panel didn't care. From time to time someone would enter the dock and whisper a hint to me, but the hints were as obscure as the questions. However I sleep tonight, I go into tomorrow with 500 miles of training in my feet, and the knowledge that tomorrow will not be as wet as the Isle of Wight, as hilly as Beachy Head, as crowded as London (though it will be pretty busy) nor as far from home as the Neolithic. Good luck, everyone. I didn't run yesterday, nor will I run today. I ought to be feeling like a coiled spring. Instead I feel a curious lassitude. Every runner's eyes are on Sunday's weather. While the Met Office forecast says 18℃, Dr Stevenson, the Marathon's medical director warns of 21℃: http://brightonmarathon.co.uk/warm_weather.html. Either way, we need not fear the cold. And in today's post came a sponsorship cheque from one of the Running Commentary community, MarathonDan. Dan is running dressed as an 9-foot tall stick of rock for Cancer Research. 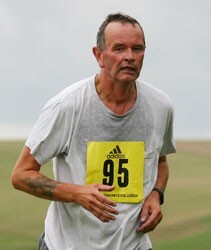 Do sponsor him here: http://www.justgiving.com/brightonrock2011. If you're feeling flush, you could sponsor me too; I'm running for Moorfields Eye Hospital Development Fund. It is something of a relief to have the last run out of the way. I need no longer fear injury, another fall on the flinty paths and a cut knee. As the Burra Mem is laid up with a broken ankle, I am perhaps over-conscious of the fragility of the parts of the body humans use to run. I worry about illness too: a headache and a sneeze might mean a cold, if so, will it be over by Sunday? The long period of self-denial that has characterised the past seven and a bit weeks, to wit my abstinence from alcohol for half of the sixteen week training programme is taken a stage further today, when I renounce coffee. Prepare for shakes, headaches and other withdrawal symptoms. Is there any point to this asceticism? I think so, for I believe coffee tends to dehydrate, thanks to its diuretic effect. I discovered that Southern, contrary to their publicity, are not running any extra trains on Sunday on the Seaford line, and the earliest one would get me to London Road at 8:25, which is a little too late for a relaxed walk to the start, deposit of baggage, and finding the green pen, so I shall drive to the University and use the park and ride. In a week's time I will have finished. I will be drinking my first alcohol for eight weeks, and insisting that I will never run another marathon again. For today, I ran a mere ten miles, some of it in thick fog, though the Cuckmere valley was in bright sunshine. I have now run at least 451.18 miles in fifteen weeks in training, probably more, given various Garmin breakdowns. Another 26.2 will be as nothing. This week saw my last ever run at work, a hills session-though central London hills are not quite the same as we have here in Sussex, Lloyd Baker Street was the best I could find, and two five mile runs along the front. I should have run a further four miles yesterday, but the small matter of taking my wife to hospital after she fell downstairs and broke her leg rendered this impossible. One week till the Brighton marathon.